Raspberry Pi enthusiasts searching for a way to manage a battery connected to their Raspberry Pi Zero, may be interested in a new piece of hardware called the JuiceBox Zero which has been designed by Samuel Anderson. The JuiceBox Zero has been designed to provide an easy way to unleash the potential of your Raspberry Pi Zero and Zero W and supports almost any single-cell Li-Ion battery. Watch the promotional video below to learn more about this new add-on card for the Raspberry Pi Zero. The JuiceBox Zero is the only battery solution on the market built especially for Raspberry Pi Zero that requires no code. It is the easiest way to make your Pi Zero or Zero W instantly portable, working right out of the box. The board features an on/off switch, status indicator LEDs and Pi Zero Camera mount built right in! 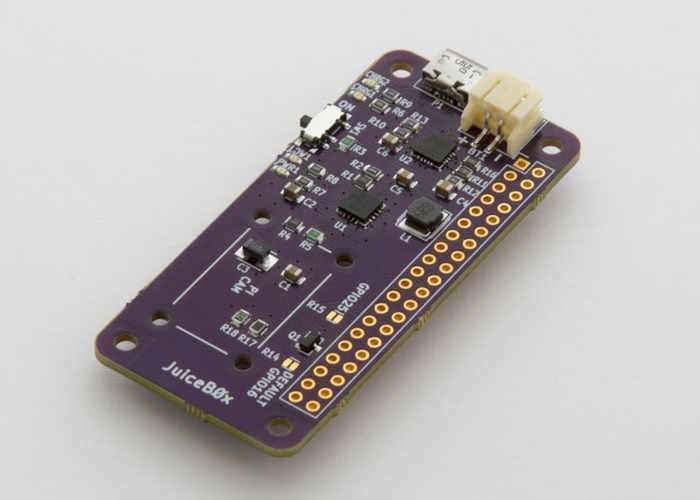 All you need to get started is your JuiceBox Zero, a Raspberry Pi Zero or Zero W, a stacking (or non-stacking) header connection, and any JST-compatible, single-cell, lithum-ion battery pack. I came up with this Idea when I had to use a battery to provide mobile power for my Raspberry Pi 3. The battery management board I used was the PowerBoost 1000c from Adafruit. While this was an amazingly simple and well designed board, I realized that it still took a bit of effort and research to make sure I hooked it up correctly to my Raspberry Pi 3. While fiddling with the battery management board mentioned above, the Pi Zero was released. When I eventually got my hands on one, I realized the true potential of the Pi Zero (and now the Zero W) lies within mobile applications. But how can you develop a mobile device if it has to be plugged in all the time?! Thus, the Idea for the JuiceBox Zero was born. I wanted a board that I could plug a battery into and just have it run with no worries! The design is based off Adafruit’s design, with a few modifications and improvements of my own. This board will work without any knowledge of software, but I wanted to let the Raspberry Pi user have an option for safe shut down. Using one line of Python, the user can poll a GPIO pin and see if it’s time to do a proper shutdown. Realizing that one of the most desired uses for the Pi Zero is for cameras, I designed an easy to use camera mount built into the board! I reached my goal of creating a functional single board that allows for easy deployment of any camera surveillance system a user could dream of, and all while running off of a rechargeable battery. For more information on the new JuiceBox Zero jump over to the Kickstarter website for details by following the link below.